If you just take one look, you can clearly see that the Mares X-Stream Fins look nothing like your traditional paddle fins. Mares says this is due to two years of resources, experiments, testing and four patents all concentrated in one unique product. The new Mares Fins get its sleek look and performance from three distinct materials, each with its own mission. They also claim the X-stream performance, comfort and lightweight design are the incredible result of sixty passionate years serving the diving industry. The Mares X-Stream is a comfortable, lightweight fin. Hinged and Channel Technology delivers both stability and a lot of power for minimal effort, making them very efficient. A comparable foot pocket and quick release buckle make donning and doffing a snap. Don’t forget, they also look really good underwater. So, what makes these new fins from mares so unique? Below is a quick Mares X-Stream Review video done by the guys over at Simply Scuba. In the YouTube video, they go over some of the basic features of the fins. You can also get a closer look at the fins and what makes it so unique. Optimized Pivoting Blade causes the blade to flex at an optimal angle during both the upward and downward strokes, increasing the efficiency of the divers kick while reducing negative trust. This feature allows the fins to have a greater angle of attack on the power stroke pushing more water backward, propelling you forward more efficiently. The foot pocket is perforated, which allows water to drain from the space between your boot and the foot pocket, eliminating excess drag as you swim. This also makes the fins easy to get on and off even while in the water. They weigh only 1.45lbs (0.66kg) per fin, this was made possible by removing areas of the fins that don’t contribute to trust. Because the fins are very light, it takes less effort to move them through the water. The combination of softer materials with stiffer materials creates a foot pocket with an extremely comfortable fit while ensuring all the power of the foot is transfer to the blades. A clear, soft rubber is used on the blade to create a Super channel. This creates a large flexible central panel that helps propel water-flow more efficiently down the fin blade instead of letting it spill over the sides, giving you the best performance with minimal effort. This allows you to easily open and close the buckles even while wearing thick neoprene gloves. ABS plus buckles allow to don and doff the fins without adjusting the straps. The double button release also prevents the buckle from accidentally opening making it really user-friendly. Generates a lot of Power for not a lot of effort. The Mares X-stream utilizes three different materials to make a fin that’s rugged, yet soft where it needs to be. The perforated foot pockets are comfortable and make removing the fins an ease by eliminating the sucking effect you normally get when removing your fins after a dive. The perforations also help reduce drag, by allowing water to pass through the foot packet reducing the parachute effect. They are also easy on your knees and ankles because the angle of attack provided by the hinged blades gives a lot of power with very little effort. Lightweight and slightly positive buoyancy, they also make an excellent pair of travel fins. 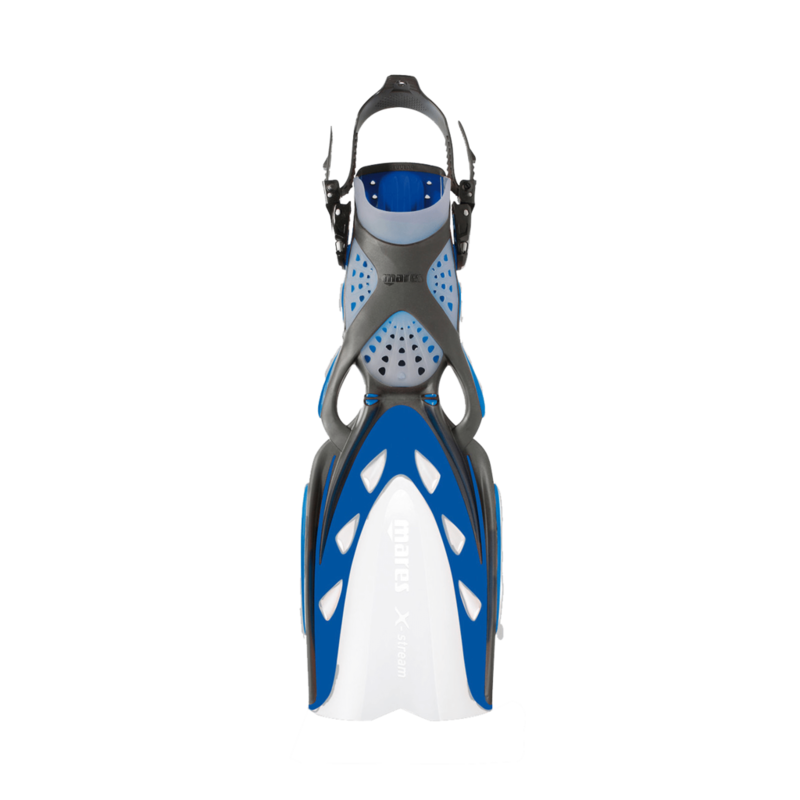 The Mares X-Stream are very pricey fins at above $200.00 list price. But, there are places where you can get them for much less if you look around. You might also find that these fins may pivot and flex easily. This may take a little time getting used to at first especially if you’re coming from more rigged dive fins. Also for more rugged buckle system, you may prefer spring straps, rather than those that come with the fins. Should you wear dive boots with these fins? Yes, you should where dive boots with these fins. The foot packets are designed to be used with booties and would be too loose if worn barefoot. Can these fins be used for snorkeling? These can be used for snorkeling as well. However, unlike most snorkel fins you will need to use them with dive boots. Are they available in other colors? They are available in a wide variety of colors and each year Mares keeps adding more colors to their line up. The bottom line is, the Mares X-Stream are comfortable lightweight fin that delivers both stability and a lot of snap on the down kick. What you get is a fin that delivers excellent kicking power that is easy on your ankles and knees and simply looks great under water. It’s lightweight design also makes them great for traveling as well.